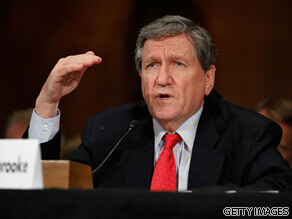 Richard Holbrooke is one of the world's most recognizable diplomats. Richard Holbrooke is your Connector of the Day. Currently he is serving in the important role of Special representative for Afghanistan and Pakistan under the Obama administration. Prior to his work for Obama he was the only person to have held the assistant secretary of state position for two different regions. He gained much recognition in 1994 when he served as the Balkans envoy and worked to end the conflict betweeen Serbia and the Kosovo Liberation Army. 5 years later he served as the 22nd ambassador to the United Nations, where he worked on a successful resolution to tackle HIV/Aids and pursued a series of diplomatic negotiations in Congo. In addition to his diplomatic work, Holbrooke has worked as an author, professor, magazine editor and Investment banker. In his current role as the Representative to Pakistan and Afghanistan Holbrooke has had to shoulder a number of complaints and accusations about US Mistakes in the regions. Why are you choosing to serve the interests of Apartheid Israel instead of US Interests? Apartheid Israel hurts US National Security Interests, why do we continue to support apartheid Israel unconditionally while their actions continue to result in the deaths of Americans? "US Officials" discovered the valuable minerals worth of 1-3 trillion USD in Afghanistan. Is it a common practice for US searching minerals in a country that you occupied – sorry you were liberalizing them – while you are losing thousands of your soldiers in the war ? How, why (it is not your country) and when such an initiative started ? What role will pakistan play in the region? Do you think it is likely that foreign troops will actually pull out in 2012 and that Afghanistan will be secure? No one has sucessfully ever been able to control Afghanistan.. not the Russians, etc... will Afghans be able to control afghanistan? What will it take for things in Afghanistan to improve? Can it? – In what way is it possible that US soldiers work for 3 months abroad(Afghanistan and Pakistan) and get released by another shift teams for 3 months, so that the soldiers can spend More Time with their Family and Improve their Homeland Security? –	In what way has the Replacement of Stanley Allen McChrystal by David Howell Petraeus Disturbed the Mission in Afghanistan and Pakistan? – What is your opinion on the way Barack Hussein Obama, the President of the United States of America, is handling Afghanistan and Pakistan? I am awaiting Richard Charles Albert Holbrooke’s replies. Dear Dr. Holbrooke, how do you feel when you read idiotic questions, like the one posed by Yusuf Bulbul on the "valuable minerals worth of 1-3 trillion USD in Afghanistan". supposedly found in that good-for-nothing country? I would like to know, how do you remain optimistic when you try brokering a peace agreement (whether Israeli-Palestinian or Afghanistan/Pakistan) when these regions have been fighting each other since the beginning of time? How to you know if/when you're making progress when for years it's been 1 step forward & 3 steps back?? You were in india recently for talks about afghanistan – what happened there? is this by FAR the most difficult job you've had???? does it compare with some of the others? What were the 10 to 15 things United States did that upset so many that they are ready to kill and die? Why were they so mad at us, pre-911? I remember, we were liked by many in the 1980's.